With the massive natural resource wealth that Alberta continues to enjoy as an accident of geography and an industrial system that craves what it has to sell, the Alberta government has long been in the enviable position of unimaginable wealth that seems – quite falsely – to be bottomless. Large volumes of oil and natural gas deposits and the hugely destructive infrastructure needed to extract and process these resources are in place in Alberta, and Premiers have enjoyed decades of pillaging the earth for provincial gain. But wait – hear me out. This is not an argument to stop the Oilsands, because I have argued that elsewhere. This is to say that if the development of the Oilsands has to continue, and I don’t believe it does, we at least have a responsibility to be intelligent, far-sighted, and ethical in how we spend that money now. One of the best ways to positively capitalize on such natural resource wealth would be to set a portion of the money Alberta makes on the sale of their resources aside for a day when the times may not be so lucrative. A giant rainy day fund, essentially. And in case you missed Jeffrey Simpson’s interesting article in the Globe and Mail on Alberta’s decision to forgo responsible stewardship of their economic future as it pertains to their natural resources, you can find the link to it here. Quite simply, this is madness. One of the only ways to make what is happening in the Oilsands worse is the knowledge that the Alberta government is failing to set any significant amount of money aside for the day when the well runs dry. Because, quite simply, they don’t believe it will ever happen. Really? Not a thing? Nothing whatsoever? 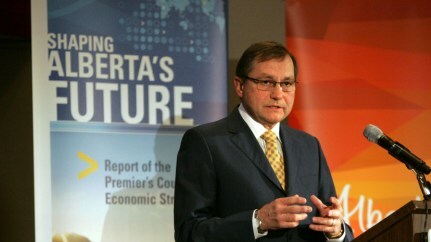 This all stems from a report Simpson discusses by former Conservative and Liberal cabinet minister David Emerson, and the report he drafted entitled Shaping Alberta’s Future in which Emerson and co. suggest what is undoubtedly political suicide in Alberta. Sounds good so far. Emphasizing the importance of diversification, seizing new opportunities, putting their resource wealth to work in new areas, etc. I’m with you. Oh. Long term thinking. Would that be the kind of thing whereby I will be penalized now, and have to work harder, and impose restrictions upon myself, in order to do good down the line for generations not yet born? If so, then Alberta is good without it. Especially if this is the kind of thing whereby government would need to be bigger, or raise taxes to pay for things that oil money is currently paying for, or take a more active role in the economy. They don’t like that in Alberta. This is what it comes down to: any Conservative government in Edmonton knows, quite rightly, that the voters will never swallow the bitter pill of setting money aside for the future by paying more now. This short-sighted approach to Alberta’s future will be devastating. Just not right now. We think it critical to realign the province’s fiscal regime such that capital received from the sale of these assets is invested in shaping the future and sustaining prosperity for generations to come. This does not mean turning Alberta into a high-tax regime… or instituting draconian measures that prevent this generation of Albertans from enjoying quality public services. It does mean following some fundamental principles of sound financial planning: cover day-to-day operating expenses from regular income (in the case of a government, this means individual/corporate taxes and user fees); treat money received from the sale of assets as capital to be put to work strategically to create greater income in the future. In other words, the wealth generated today should not be blown on the luxuries and expenses of today only. We have a responsibility to set money aside not only as a “massive pension fund for future generations” as Marsden has claimed, but as a way of ensuring that the wealth we generate today can be enjoyed by more than those simply lucky enough to be alive while the getting was good. It’s a shame the Emerson report is “dead on arrival,” as Simpson claims. Because with great power and wealth comes great responsibility. And Alberta is showing little interest in accepting theirs.